The unique services I provide assist small to mid-sized manufacturers and distributors in quickly and affordably improving inventory, manufacturing, and warehousing operations. My expertise and approach towards inventory management and warehouse operations is well documented in my books and numerous articles I have authored. My streamlined approach towards consulting keeps project-level costs down, resulting in truly affordable expert assistance. I offer simple hourly-rate pricing for most of my services without any project-level commitment requirements. My Rates and Terms are available online along with detailed descriptions of the services I provide. In recent years I've had a lot of success offering E-consulting in addition to conventional consulting services. E-consulting has proven very effective with many of the services I offer and emphasizes my commitment to providing fast, affordable, expert assistance to businesses that otherwise may not have had access to my level of expertise. As a fully Independent Consultant, I work strictly as a client advocate providing unbiased analysis and recommendations. My affordable services focus on detailed improvements that lower operational costs and increase your ability to service your customers. Inventory Operations Consulting L.L.C. is based in Kenosha, WI and provides inventory management, material handling, and warehouse operations consultant services to manufacturers and distributors throughout the United States. My primary service area covers Southeast Wisconsin and Northeast Illinois including Kenosha, Racine, Milwaukee, and Chicago areas. E-consulting and limited other services are available to businesses in the United States located outside of my primary service area. Key Services provided by Inventory Operations Consulting LLC. Inventory Management, Forecasting, Safety Stock, Planning Systems. Warehouse Processes, Order Picking, Receiving, Putaway, Shipping, Replenishment. Services I do not provide. For more information on Inventory Operations Consulting LLC services, a good place to start is my Frequently Asked Questions page and my Inventory Management and Warehouse Operations Consulting Services page. Small projects are always welcome. 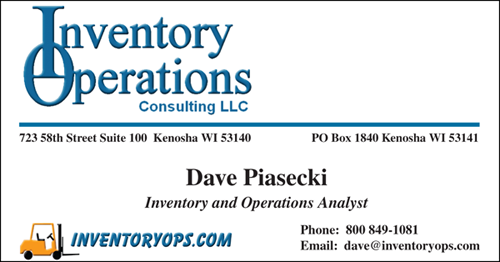 Dave Piasecki, Inventory Operations Consulting LLC.